Click on 'Apply for Membership' if you are not a member of our group. I did not get any password, and when I tried to register, it says my email is already there. I did get an email about the recording, but without a password. salamu alaikum i am asingle muslim man not marreid seeking islamic marriage with an educated muslim lady. AsSalamu Alaykum Wa Rahamatullahi Wa Barakatu...I also would like the password to the recording, I was there for the Halaqa but i missed the first part and would like to listen to it. When i put my email for the password request it says that i am already in the mailing list, but i received no email. Please i would also like to receive the password for the recording. dear sisters if you are having a problem accessing the first box then fill out your passwords on the link just below the box where it says: "in case that does not work...." jazzak allah khair! jazakallah to the habibi halaqa team for making this available to us. jazakkallah khairan to habibi halaqas team and a special thanks to shaykh riad quarzazi. @Ame: glad you enjoyed the webinar alhumdulillah! I WOULD LIKE TO LISTEN IN ON QUITE A FEW OF YOUR RECORDINGS, HOWEVER ONCE SIGNING UP TO RECIEVE A PASSWORD, i HAVE YET TO RECIEVE ANYTHING...iS THERE ANOTHER WAY TO SIGN IN SO THAT i CAN BENEFIT, INSHA ALLAAH. What great and very beneficial reminders, walhamdulliaah. 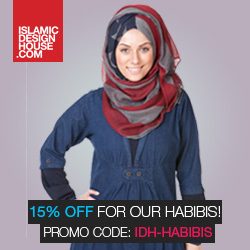 I am pretty new on habibi halaqus...but , I am so greatful to have come across this site. There is lots of benefit here, masha Allaah. I have enjoyed this webinar so much I plan to listen again, Insha Allaah ta aala. really, great points. Sukrn, wal BarakAllaah Feek ! @Anonymous: All Passwords have been sent out. If you havnt received it, it maybe that you typed in your email address incorrectly. I've entered my email the second time and still haven't received any password. where do i put the password i got? Is it still possible to get the password to listen to the webinar, as I have just found the website? JazakAllah Khair for the webinar. It was good Masha Allah. I have a request to make here. There are some very immodest or may I say obscene ads coming up on this page which Nauzubillah make me cringe. May Allah SWT reward you with good. From my heart, 'truly mashAllah'! May Allah almighty shower the Habibi Halaqa website and shiekh Riad with unlimited nour, blessings, and guide you and all Muslims towards the righteous path. I have learned so much from the shiekh Riad - alhamdulilah. May Allah almighty bless him with more righteous wisdom. The way he conveyed the message of marriage was straight forward and direct but also respectively humorous - mashAllah. I would just like to know why place a password on the video?? Let it be shown to the whole world, let truth spread. Believe me this is very beneficial information, not only to sisters but also to brothers.